If you're a snake, life can be slow going; it can be hard to get around without legs. But if you're a Slytherin, then life is basically flying by, moment to moment—that's how much fun you're having! While some in the wizarding world used to mischaracterize all Slytherins, we know today that the stereotypes are simply not true. There are amazing serpents out there, using their bright ambition, tireless drive, and cunning mind for good in the world! In fact, you've dressed like one for Halloween, and you couldn't be more proud of how you sorted your costume. Now, you just need the finishing touches, like this Harry Potter Slytherin House Patch Striped Scarf—see what a positive impact you're making already? This is a genuine, licensed scarf taken straight from Hogwarts and brought to your doorstep by owl! It's a soft knit in dark green, light green, and silver, and the fringed tassels at the ends coordinate perfectly. A small leather snake patch adorns one side, while a tag reading "Harry Potter" rests on the other. One day, you'll have a little witch or wizard of your own, and you can share with them all the pride of your Slytherin roots. 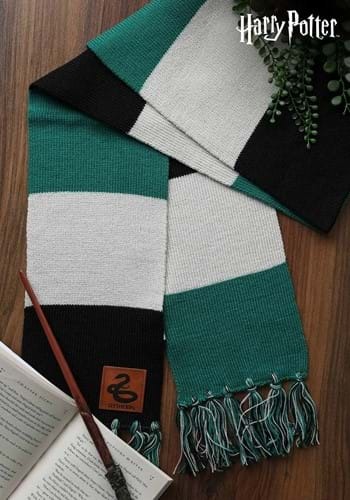 A new generation of serpents is changing the way the world sees the green and silver, so keep being fabulous out there, decked in your house colors!